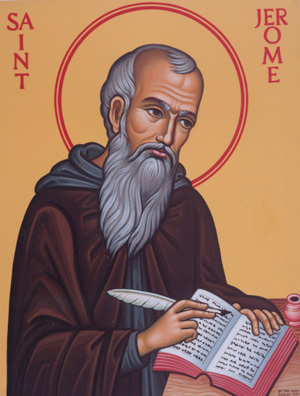 Saint Jerome, born Eusebius Hieronymous Sophronius in Strido, Dalmatia, in 327. He came from a wealthy, Christian family and was sent to school at Rome. Here he began by leading a fast life but after some years, he set off on his travels to Asia Minor, arriving finally in Antioch. Antioch was an important ancient city on the site of the modern Antakya, Turkey. In 365, he was converted to the faith and baptised in the faith. At this time, he started his studies in theology and Hebrew, living as a hermit in the Syrian Desert and returned to Rome in 382 where he taught a number of prosperous female students including Marcella and Pauls with their daughters Blaesilla and Eustochium. The Pope soon summoned the now famous Hebrew scholar and set him the task of translating the Bible from Greek and Hebrew into Latin, which was to be his noblest work, known as the Latin Vulgate. Retiring to his beloved Bethlehem, the eloquent hermit lived for 30 years in his solitary cell, producing a stream of luminous writings upon the Christian world. He died on September 30th, 420, and was buried in the Church of the Nativity. He is the patron saint of librarians, scholars, students and abandoned children. His feast day is 30th September.